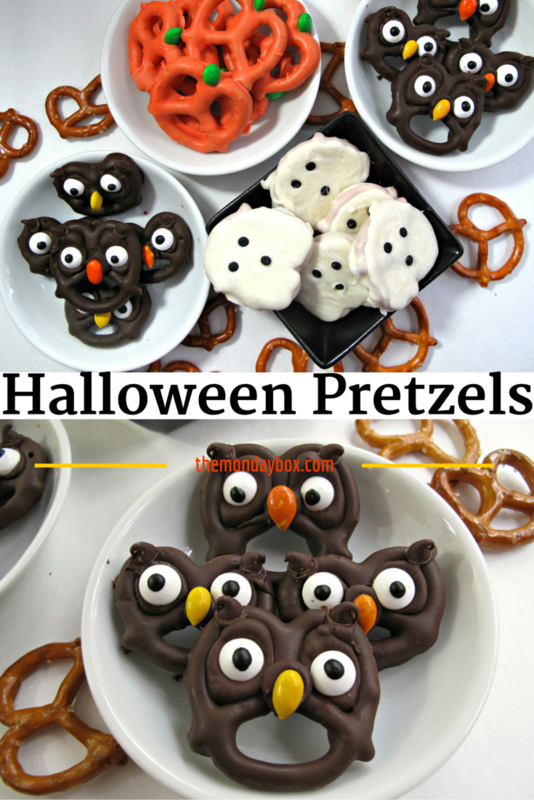 You are here: Home / Pretzel / Halloween Pretzels- easy, fast and fun! Halloween Pretzels- easy, fast and fun! I have two adult children. From the time they were teeny tiny, they have been polar opposites in so many ways. My daughter, an early to bed, early to rise type, is the queen of plans. Her days are filled with non-stop activities. Ten minutes is too much down time. Her calendar is organized months in advance. My son’s biological clock has never been set to daylight wakefulness. He is at his best late at night. In his infancy, his vampire-like hours turned me into a zombie. His preference for late rising made our school mornings a challenge (to say the least). Unfortunately, our school system required attendance in the day time, resulting in the purchase of a Sonic Boom alarm clock and my son’s love of coffee in high school. He rarely plans in advance, instead successfully tackles things as they occur. When I was younger, I was a planner like my daughter, but with procrastinating tendencies like my son. For some reason, the older I get the more I am prone to procrastination. However, I don’t think I will ever be as laid back as my son about leaving things until the last minute. Instead, I leave things until the last minute and worry about it! These chocolate covered pretzel twists can be left to the last minute without worry. A variety of designs can be haunting your kitchen in very little time. 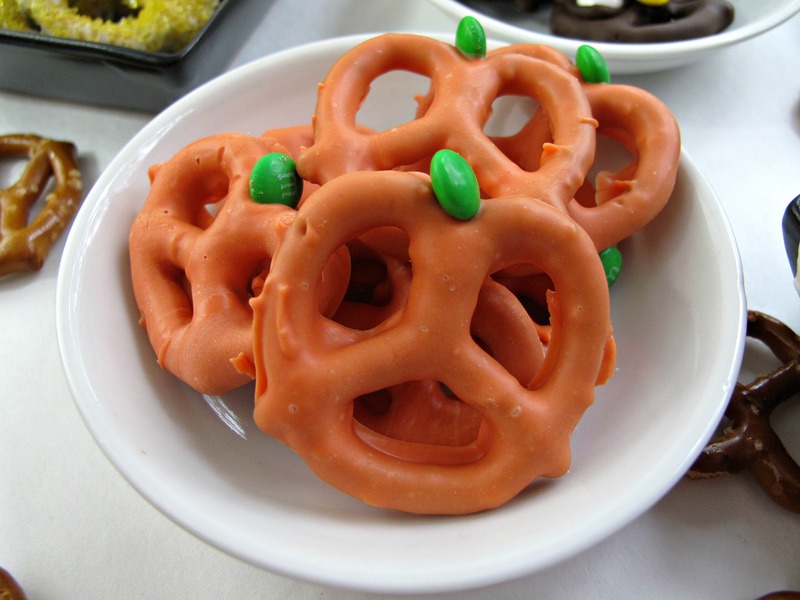 Or if you are a planner, Halloween pretzels can be made a week or so in advance, because they store beautifully. They are also great care package treats for cool weather mailing. 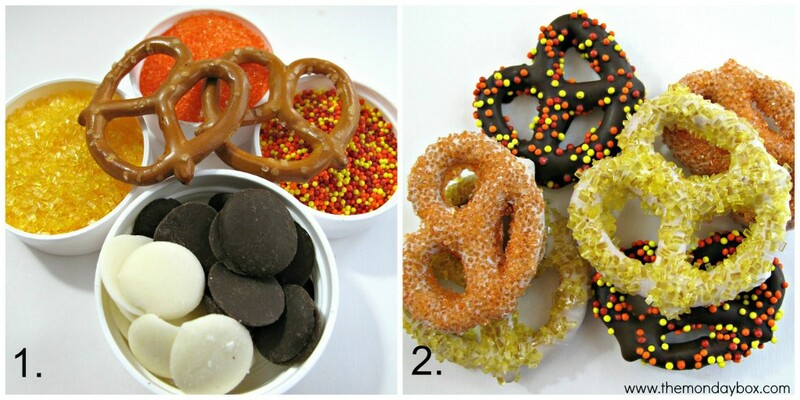 So, for your last-minute or on-top-of-things fun, here are the simple directions for creating 5 different chocolate covered Halloween pretzels. I use dipping and coating chocolate from Chocoley.com for all of the designs. The Chocoley discs melt beautifully, coat easily, require no tempering (yeah! ), and are real chocolate for real chocolate flavor. I used Snyder’s pretzel twists (smaller and rounder) and Rold Gold pretzel twists (slightly larger and a bit more elongated). 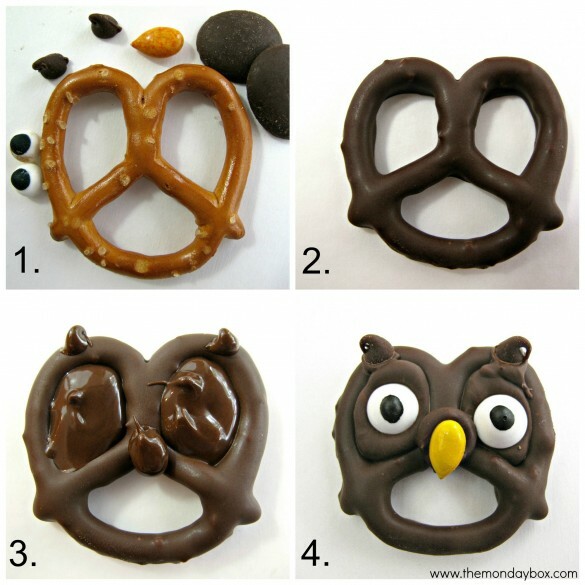 Each owl is made with one pretzel twist, two candy eyes, two mini chocolate chips, one candy coated sunflower seed, and dark chocolate melting discs. For 18 owls, I used one cup of melted chocolate for dipping plus ½ cup in a plastic bag for piping. Use a fork to dip the pretzels into a small bowl of melted chocolate. Tap excess chocolate back into the bowl and place the coated pretzel on a wax paper lined tray. After coating 6 pretzels, put the tray into the refrigerator to set the chocolate for about 5 minutes. Continue until the desired number of pretzels have been dipped. 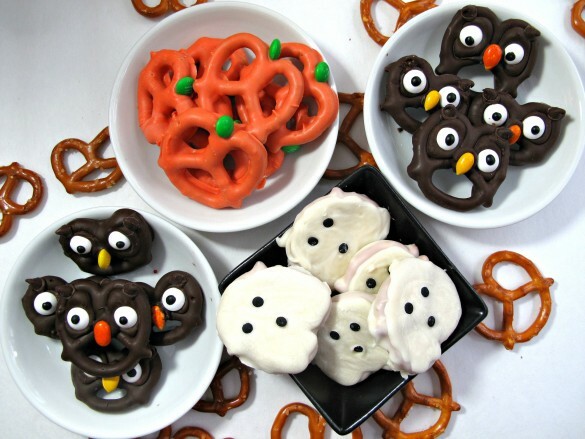 With the coated pretzels on a wax paper lined tray, use a disposable piping bag filled with ½ cup of melted chocolate(or a plastic bag with a tiny bit of one bottom corner cut off) to fill in the eye holes and to pipe dots for the ears and nose. Add the chocolate chip ears, candy eyes, and sunflower seed beak. Return the tray to the refrigerator until the chocolate is set. 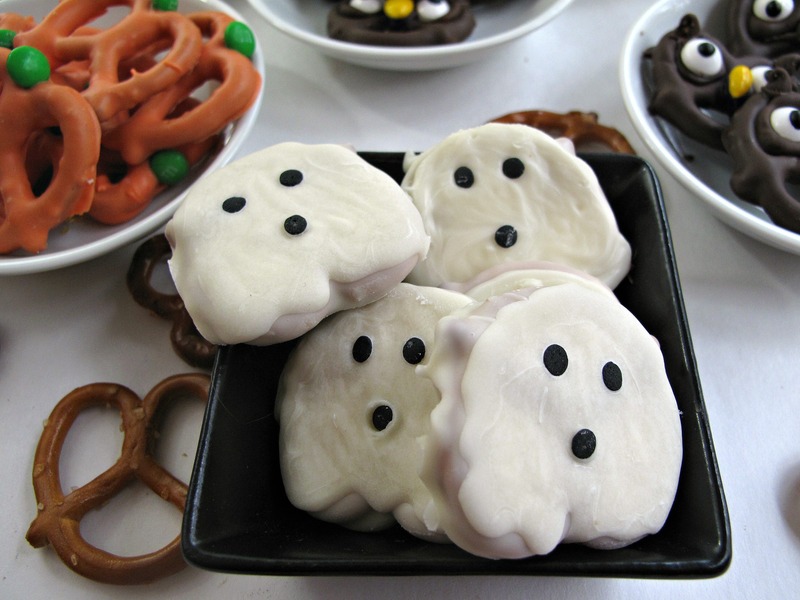 Each ghost is made with one pretzel twist, three black sequin sprinkles, and white chocolate melting discs. For 18 ghosts, I used one cup of melted chocolate for dipping plus ½ cup in a plastic bag for piping. With the coated pretzels on a wax paper lined tray, use a disposable piping bag filled with ½ cup of melted chocolate (or a plastic bag with a tiny bit of one bottom corner cut off) to fill in the holes. 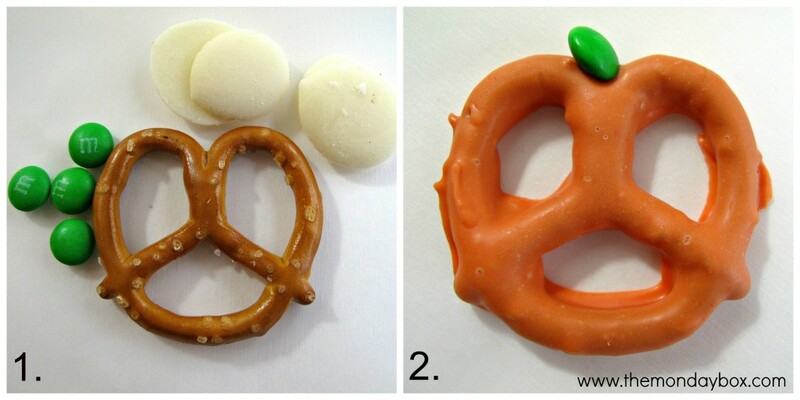 Use the piping chocolate to cover the top of the pretzel. Add the sequin sprinkles on top of the unset chocolate for the eyes and mouth. Return the tray to the refrigerator until the chocolate is set. Each pumpkin is made with one pretzel twist, one green mini m&m, and white chocolate melting discs tinted orange*** with candy coloring. Use a fork to dip the pretzels into a small bowl of melted chocolate. Tap excess chocolate back into the bowl and place the coated pretzel on a wax paper lined tray. Place a green m&m stem on to the unset chocolate. After coating 6 pretzels, put the tray into the refrigerator to set the chocolate for about 5 minutes. Continue until the desired number of pretzels have been dipped. Return the tray to the refrigerator until the chocolate is set. ***Note: Do NOT use regular food coloring in chocolate. The chocolate will seize and be unusable. Instead of colored chocolate, you CAN coat the pretzels with white chocolate and sprinkle the unset chocolate with orange decorating sugar. 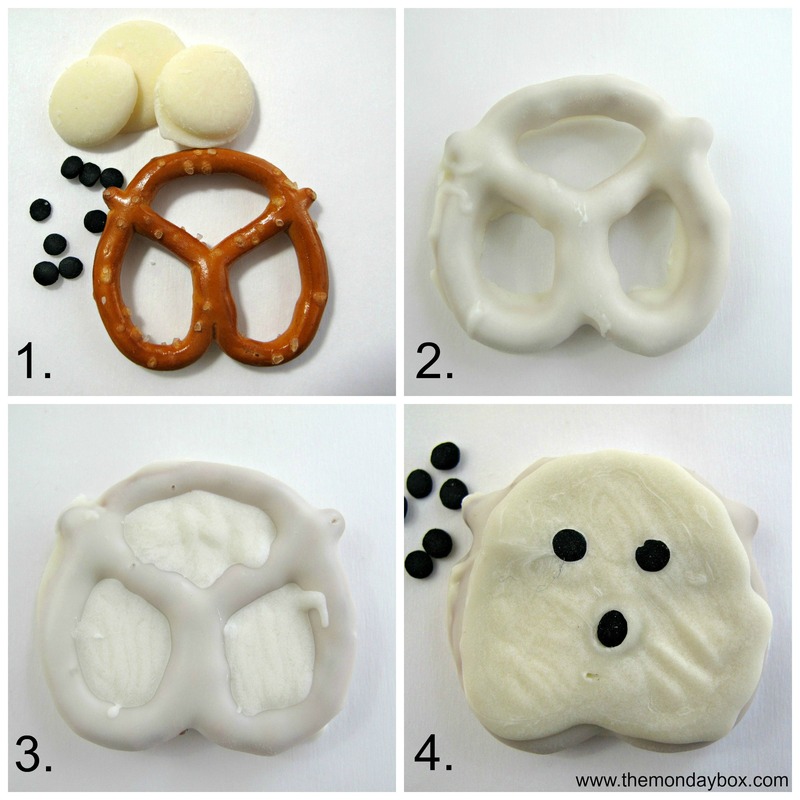 Each mummy is made with one pretzel twist, two candy eyes, and white chocolate melting discs. On a wax paper lined tray, use a disposable piping bag filled with ½ cup of melted chocolate (or a plastic bag with a tiny bit of one bottom corner cut off) to pipe lines across the pretzel for the mummy wrapping. Add the candy eyes onto the unset chocolate. After coating 6 pretzels, put the tray into the refrigerator to set the chocolate for about 5 minutes. Continue until the desired number of pretzels have been dipped. Each chocolate dipped sprinkle pretzel is made with one pretzel twist, sprinkles or decorating sugar, and white or dark chocolate melting discs. Use a fork to dip the pretzels into a small bowl of melted chocolate. Tap excess chocolate back into the bowl and place the coated pretzel on a wax paper lined tray. Coat unset chocolate with decorating sugar or sprinkles. NOTE: Decorating sugar colors are best on white chocolate rather than dark chocolate. After coating 6 pretzels, put the tray into the refrigerator to set the chocolate for about 5 minutes. Continue until the desired number of pretzels have been dipped. Due to a technical glitch, rather than my procrastination, this post is more last-minute than I originally planned. Luckily, these chocolate dipped Halloween Pretzels are super fast and easy to make for tomorrow or pin for next year. Happy Halloween! If you can’t get enough of these adorable owls, take a look at Cinnamon Spritz Owl Cookies for more fast Halloween Owls! Check out our tasty treats on Facebook and fabulous finds on Pinterest too! These are so creative! 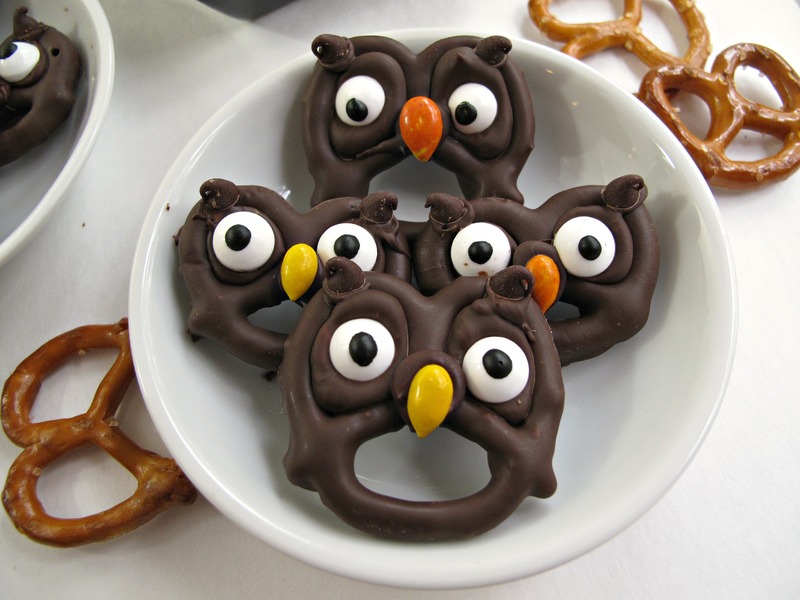 I just love those owl pretzels – adorable and yummy! These are by far the most amazing chocolate covered pretzels I have ever seen! How adorable and creative! I love pretzels and chocolate so I know i could enjoy each and every one of your deliciously dipped pretzels. Have a great week! 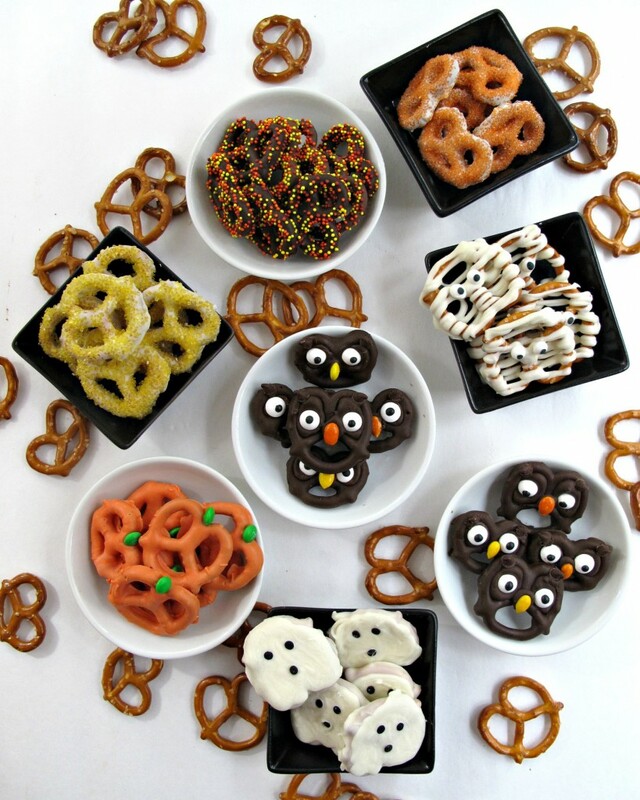 I just love treats using pretzels! 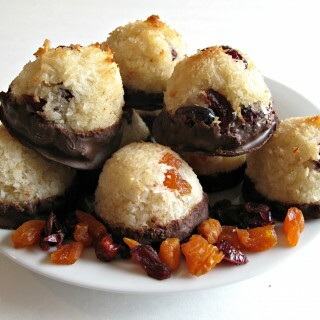 Must be the crunch and the sweet and salty combo when you combine it with chocolate. Love all the decorated variety! Wish I had seen this…I could have tried to tackle a couple for the 5th graders’ bake sale. Very, very cute! Halloween usually makes me cranky, but these made me smile. So adorable. And you instructions are idiot proof!! Sounds just like my sister and I! We are complete polar opposites in just about everything! And these pretzels are just too cool Wendy! So fun and festive and simple! Thanks, Ashley! Siblings have a family connection, but often that is where the commonality ends. It keeps life from getting monotonous and keeps moms on their toes! ;) These pretzels were easy and fun. I am now on a roll with chocolate pretzel ideas for upcoming holidays too! So adorable! You did a great job on these! Thanks, Michelle! These cuties are super easy and fun to make! These are wonderful. I especially love the owl. Great pictures. Excellent instructions. I can’t wait to make them. Thank you, Lisa! The owl is my favorite too! He has personality. 🙂 Have fun and enjoy. Hi, Jamie. I purchased these eyes at World Market. I have also seen packages of candy eyes by Wilton at Target and Party City in the baking section. I hope this helps. What did you use for the owls ears? Which size eyes did you use for the owls? Thanks! Crystal, I bought these eyes at World Market. They have a limited but inexpensive line of sprinkles, eyes, and food markers. There was only one size of eye. I think the World Market eyes are the same size as the Wilton eyes sold at Target. They are larger than the “medium” size eyes I sometimes purchase from a cake decorating store, but I think the medium eyes would also work. Hello there! So I am about to do this cute owls of your for a surprise party for my friend. She loves owls… Anyways… I just have a small question. What size of pretzels dos u use. I thought they were mini. But the empty spaces are quite big. Love your ideas! Thanks so much, Stephanie! I would love to talk about contributing to SomewhatSimple and will definitely send you an email soon! Link Party Palooza has so many great ideas! These are just adorable! And who doesn’t love chocolate covered pretzels?? Pinned. Thanks for sharing. How did you coat the sunflower seeds? Colored chocolate as well? Hi, Nicole. I purchased candy coated sunflower seeds (sunflower seed covered in chocolate then a candy shell). I have seen them at World Market, Trader Joe’s, and the bulk nut aisle at my regular supermarket. I hope that helps! Enjoy! I love these! So cute and easy to create, pinning for next year! Thanks for sharing! Thanks, Erica! I made these at the last minute last year and still love them. 🙂 Thanks for pinning! Where do you get the sunflower noses for the owls? Hi, Lori. Candy coated sunflower seeds are sometimes available in the produce aisle or bulk nuts area of a supermarket, and they are available in a tub at Trader Joe’s. I bought these at World Market in the candy section. They come multi-colored in a tube and I pick out the colors I need. Adorable! Can these be made ahead and frozen? Hi Barb! I found this information on freezing chocolate covered pretzels http://www.chocolate-candy-mall.com/can-you-freeze-chocolate-covered-pretzels.html Basically, it says you can freeze them but it could effect the flavor. You are better off keeping chocolate covered pretzels in an airtight container at room temperature. They stay fresh that way for a long time. I love pretzels with sweet candy coatings…so good! Thanks for sharing your fun pretzel decoration ideas on Merry Monday. Pinned and will be featuring this in a Halloween treat round-up. Thanks so much, Erlene! These pretzels always make me smile. Thanks for hosting, pinning, AND featuring!! These chocolate covered pretzels are to die for. I just love all of them. Stop by Wonderful Wednesday Blog Hop since you are my feature pick this week. Thank you Beverly! They are fun to make and yummy to eat. 🙂 Thanks for featuring them!! These are all so cute…I’d have to make them all! 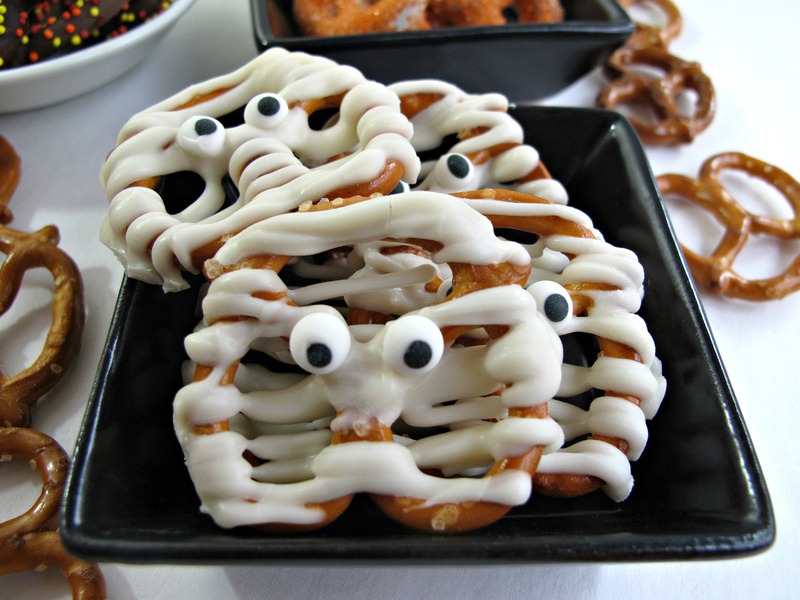 So cute – love these Halloween Pretzels. Thank you for sharing at Snickerdoodle Create Bake Make. These are so cute. Might just make some to tuck into a college care package. I think they will be much appreciated. Stopping by from Best of the Weekend! What a bunch of fun pretzels! Pinned – Thanks for sharing at our What’s for Dinner party! Hope you bring more deliciousness this Sunday! Have a great weekend. Definitely making these with my kids, thanks! Hi, Renee! I hope you and your kids have fun making the pretzels! Happy Halloween!